This summer most of our district read Teach Like A Pirate by Dave Burgess. We were fortunate to have him speak at convocation as well. He was very inspirational in getting teachers to think differently about ways to make learning an experience. He challenged us to transform our classrooms into places students would pay for. It has been fun seeing this approach to learning unfold this school year. 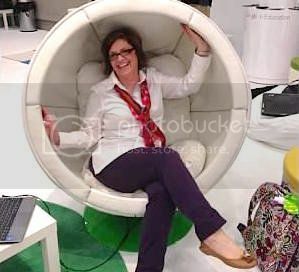 I began thinking about ways to use social media to engage students and connect content to their world...to take those key concepts to make the learning experiential and memorable. Below are six crazy ways to use social media to fire up the classroom. 1. 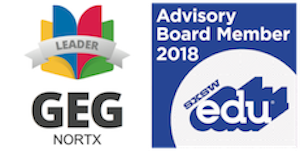 Create a social media campaign to get high profile Google Hangout partners such as authors, experts in their field, world leaders, superstars...think BIG! Create YouTube videos to formally invite the target guests. Be wildly creative and include your students! Who can say no to them! Then blast the Internet with your social media campaign. 2. Create parody or special interest Twitter accounts and manage and post daily to engage your students in active dialogue connecting your content to the real world. 3. Host Twitter or Instagram scavenger hunts or mystery hunts connecting your content to current events. I loved Catlin Tucker's use of an Instagram Scavenger Hunt while on a field trip. 4. Have students guest post on a class blog. This is a great way to share the learning with parents and the community and to give students a voice. 5. Get students to create and post content-related memes to the class Twitter or Instagram accounts. 6. Spark a revolution for your students to participate in...find a need in the community and set out to solve it. Build real-world skills in your students while integrating or connecting your content to the movement at hand. 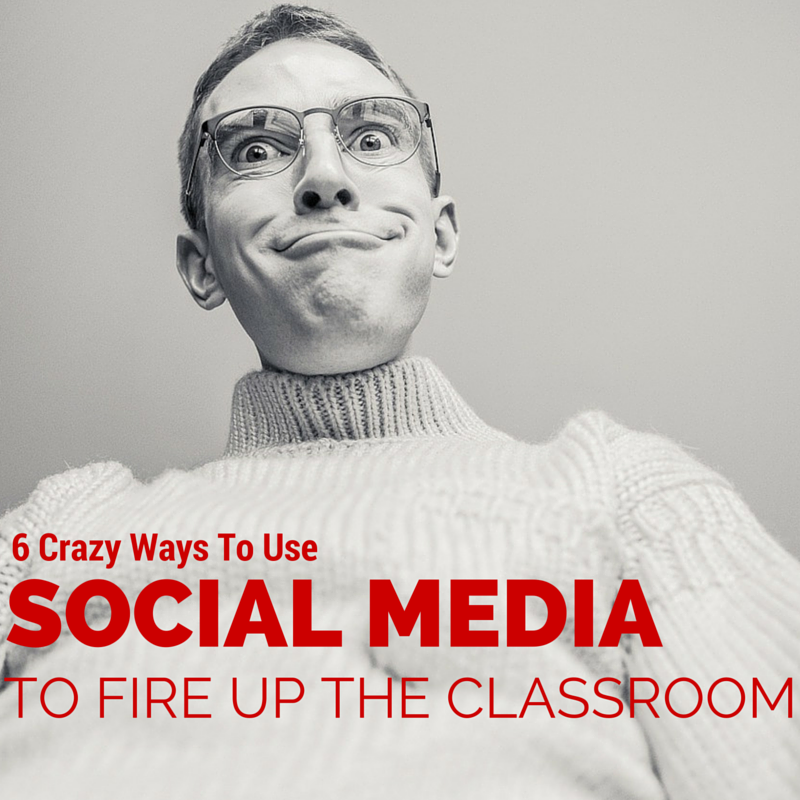 I'd love to hear some other, nontraditional ways teachers are using social media in their classrooms. Feel free to post something that has been wildly successful for you and your students. I am so excited about the recent announcement that Google school domains FINALLY have the ability to filter video content in YouTube. Anyone who knows me, knows this has long been a thorn in my side. We have moved into an age where YouTube is synonymous with learning and to block such a huge resource for teachers and for students seemed ludicrous although given some of the questionable content on YouTube, I totally understood the reasoning! So this is how it works...once the GAFE domain admin turns this on, it gives teachers the ability to approve or whitelist videos for the entire domain. 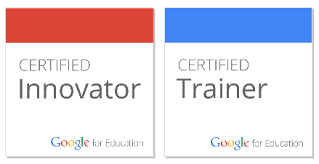 Many videos are already approved by Google, but the tools include designating approvers within the domain...typically the classroom teachers! This is such a great update for education today; YouTube can serve as a great repository for teacher and student-created media! Plus, I love the YouTube Video Editor Tools and they are one more tool that can be used in helping students understand the need for using copyright-friendly resources! So how does this work for the teachers and students? 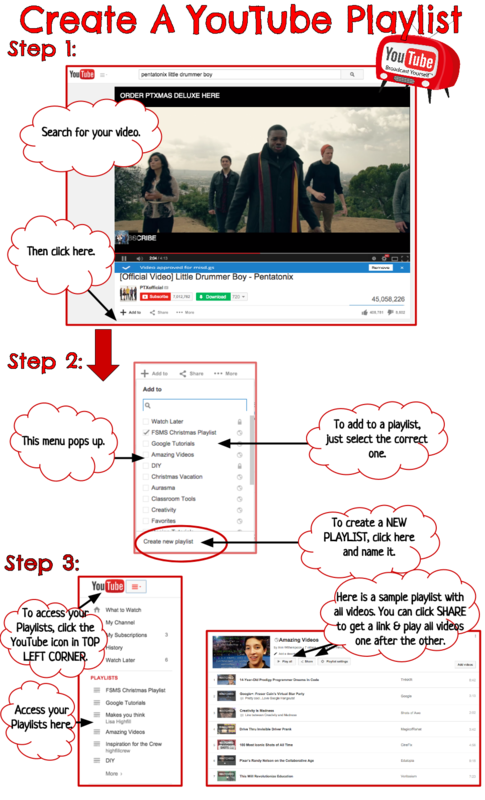 Students will gain access to YouTube if they are signed into their Google account. Verified domain teachers, when logged into their school domain, will see a blue bar below each video identifying whether it is approved or not. They will then have the ability to approve videos by checking the APPROVE button. If they inadvertently approve a video, the teacher can simply click the REMOVE button to block the video once again. (See the graphic below). PLAYLISTS: I love YouTube playlists which are simply the curation of videos with a certain theme or topic. When you see a video you want to have the ability to quickly refer back to, simply click the "+ Add To" below each video. 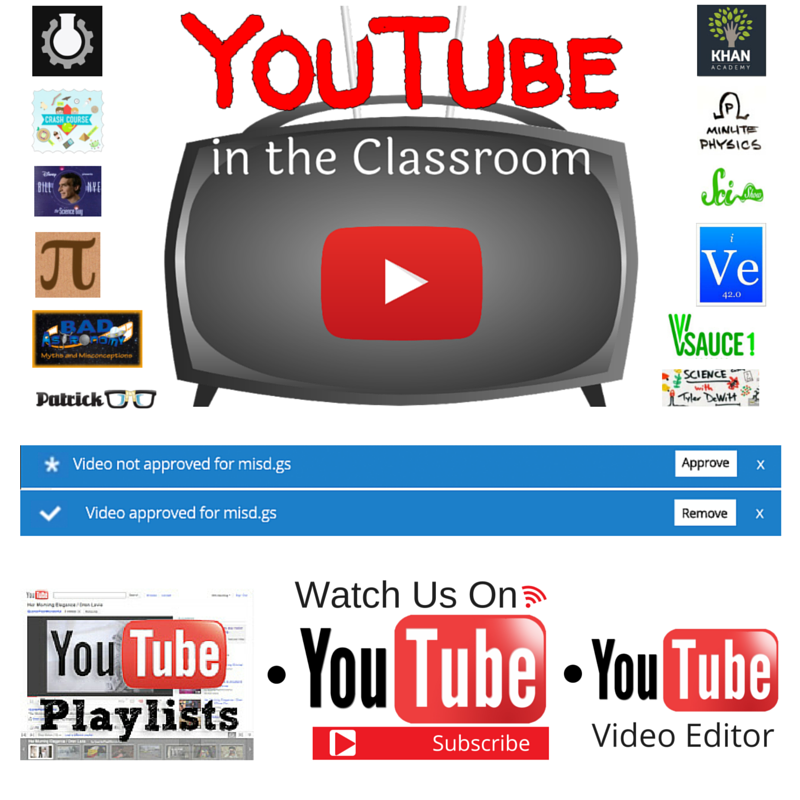 YOUTUBE CHANNEL CREATION: Teachers and students both have the ability to create their own YouTube channels and be able to showcase their own media creations! What a great repository of work! To make your YouTube channel look professional, create your own channel header! I love to use Canva and they have a YouTube channel header template! (The recommended header size is 2560 x 1440 pixels.) See the slide deck below for a link to channel creation help. YOUTUBE VIDEO EDITOR: Most people don't even know YouTube has a video editor within this app and it's actually pretty cool! There are copyright-friendly music and video clips that can be used in the editing process. You can also annotate on top of videos and add links to other videos. This is a great tool for creating Choose Your Own Adventure videos! One additional benefit...students can download the YouTube CAPTURE app for iOS or the YouTube Creator Studio for Android phones and they can upload their clips directly to their YouTube account for editing purposes...hello Chromebooks, there's a good little video editor in town! Just click on the slides for links to these channels. Have a favorite I've missed? Feel free to share your favorites! Last year at this time we launched over 2500 iPads across our district to math and science classrooms...this year, it's Chromebooks. While I love our iPads and the learning they inspire in our students, using them in a shared environment has been challenging to say the least. A shared environment is where Chromebooks shine! Students are able to customize their Chrome browser with extensions and apps that can enhance the learning process. They can also customize their Chromebooks with adjustments to the trackpad and keyboard to suit their computing needs...and when they log out, those customizations go with them! So how do we get the Chromebooks school ready? #1: Web of Trust-EVERY student needs this extension added to their Chrome browser. It crowdsources website reliability and vets web search results with Green, Yellow, and Red dots to indicate a website's trustworthiness. No longer can students rely on all .org sites to be dependable. For instance, www.martinlutherking.org is a site run by white supremacists! #2: AdBlock-Another Chrome extension students should not go without! It blocks ads on web pages as well as YouTube and Facebook. I love to surf the web and look up at the extension and see high numbers in the lower right-hand corner of the extension icon...it's doing its job! When you install this extension, it asks for a donation. While this extension is free, you will be more than happy to send the creator and his wife a few bucks their way! #3: read&write-This app is fabulous for offering reading and writing support in Google Docs and on the web. Students can have the text read, they can highlight, have a web page simplified. There is a free version with fewer options than the paid version. I know many schools pay for their students to have access to the full version of this extension. It is truly learning made easy! #4: Cite This For Me: Web Citer- Can I have an OMG! I love this extension. I've always struggled with getting a website cited correctly! Just click a button and let it do its magic...then copy and paste! It works for APA, Chicago, Harvard, and MLA formats. #5: Save To Google Drive-This extension allows you to save web content, screenshots, media, and web links directly in Google Drive...very handy on a Chromebook! #6: Grammarly- I love this extension; I use it all the time. As you type online, it is constantly monitoring for spelling and grammar errors. I mean...who doesn't need this extension? #7: Classroom Split- This is an extension commissioned by Alice Keeler for students to be able to split their screens between their project instructions and their working Google document inside Google Classroom. This extension is sure to make task management much easier. #8: Screencastify Extension-To be able to screencast on a Chromebook, this extension seems to be the best. But note that it may not work on older Chromebooks. One thing I love about this extension is the annotation toolkit that is available during the screencasting process. Adding a few Chrome apps will also help students be more productive and allow them to maximize these tools for learning. 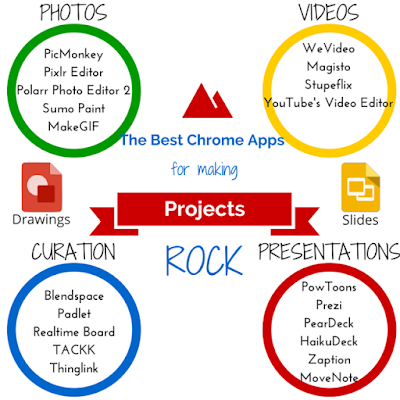 Now my shortlist for Chrome apps doesn't include all of the cool, really great apps that can engage the learner in creating some awesome projects such as those mentioned in the graphic to the right. However, there are some really great apps that will aid students in being more efficient in their learning. 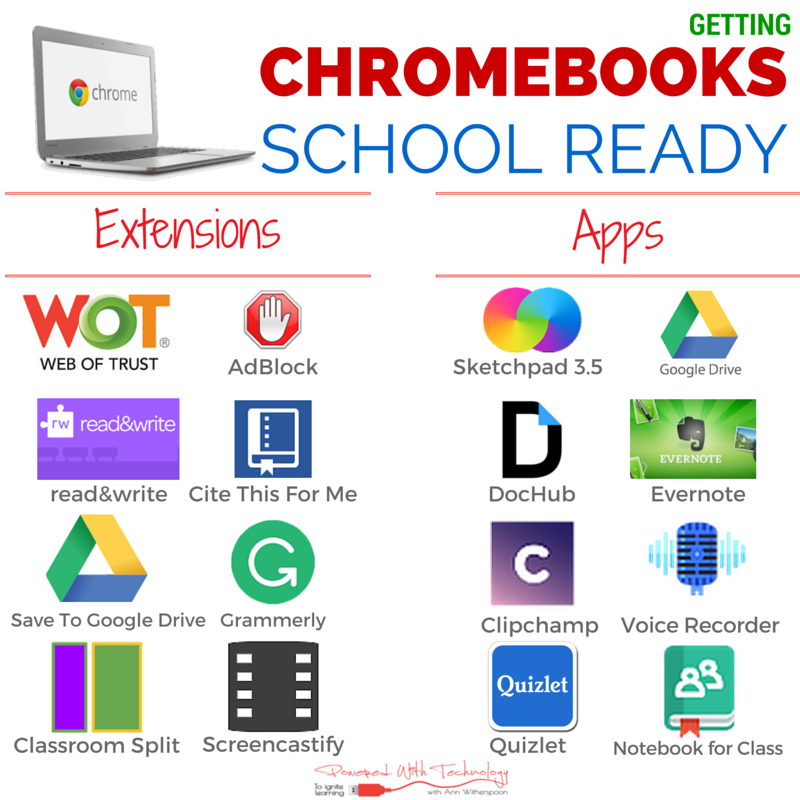 Those are the apps I want to feature as those needed to get our Chromebooks school ready. #1: Sketchpad 3.5- We have recently deployed touchscreen Chromebooks and this app is awesome for those. If your Chromebooks aren't touchscreen, this app can be skipped. It's basically an artboard that allows you to load in graphics to annotate, to free draw. There are multiple backgrounds such as graph paper, blueprint, and others that can be loaded. You can add text; it's just a very versatile app, one that helps the Chromebook bridge the gap between a laptop and an iPad. #2: Google Drive- This suite of apps goes without saying...it's the classroom workhorse of today. This app should be loaded on all devices so that students have access to their files at any time, anywhere. #3: DocHub- This is another staple app that can serve students in being able to edit, annotate, and merge/reorder PDFs. #4: Evernote- Need to take notes, compile research information, curate content, you name it, Evernote can probably do it. I used it a couple of years ago as an Interactive Notebook for my social studies class. Students have the ability to share notebooks with peers/teachers and there are several great apps such as Skitch that can be integrated with Evernote. #5: Clipchamp- One of the major missing pieces on the Chromebook is a camera that takes video, but alas, Clipchamp has recently been updated and now "Houston, we have video!" #6: Voice Recorder- This is a great, easy-to-use audio recording tool that allows the students to quickly record and save to Google Drive. This app and Clipchamp are both great, easy apps that will allow students to quickly create media. #7: Quizlet- This is just a perennial favorite app to create/search flashcards to be able to take your learning with you. #8: Notebook for Class- Want to do a digital notebook? Give this one a try. It's pretty slick looking and is very easy to use. There are several themes you can select to customize your notebook. The free version has some limitations but seems to be adequate. I'd love to hear what others have found to be critical keys to maximizing Chromebooks in the classroom. Please share! Data has shown that formative assessment is vital to the learning process. It reveals to the learner and the teacher what information has been acquired, and what is still needing to be learned. Teachers have been using a variety of techniques for assessing student learning, but just how accurate have prior strategies been? Fortunately with today's digital tools, making learning visible has become much easier. This also allows teachers to zero in on exactly what gaps exist. It is important to note that formative assessements are to inform the teacher and the student of acquired knowledge, not to punish. These can be used to make learning fun! Kahoot has some great quotes throughout their app that remind us of that! "Make learning awesome!" The Formative App reminds us, "I think, therefore I am. (Cogito, ergo sum.)" Let their little reminds spur you on to engage students in the learning process. Padlet: This is a great tool for having students post visual representations of their learning. This is an easy assessment tool and teachers can create and use custom backgrounds to aid in its use as an assessment tool, i.e. formatting a KWL chart as a custom background. Padlet suggests when creating a custom background to set the size to 1280 x 720. Think you may need a little help with getting started with Padlet? Click here for a quick tutorial video. Google Forms: There are so many options for using Google Forms. I love the ability to insert YouTube video clips, especially in math when a question isn't answered correctly using the "conditional branching" option. Two under-utilized question options in Google Forms are using the scale and grid. These are a great way to survey depth of understanding, confidence in the content or comparing various aspects of it. Click here to watch a tutorial video on Google Forms that will show how to use the conditional branching technique. Formative: I love this web app! The first time I used it, I was totally taken by the Draw Tool. It has since been updated and works even better. When you create a new assignment you have three a choices, Add A Question, Add Content, and Upload and Transform. Within these there are additional options. My favorite, that sets Formative apart from the other apps, is the ability for students to draw on a whiteboard. This is an amazing tool for a math class, an ELA class for reading comprehension, science and social studies classes for diagrams and labeling. Click here to watch a tutorial video on how to use the Formative app. Google Classroom: This fall Google Classroom launched several new updates and one of those was the ability to "Create Question". This is a perfect environment to ask an introductory or concluding question to measure understanding, to assess or survey for feedback, or to take a quick poll. Click here to check out a tutorial video on the new Google Classroom updates that just launched this fall of 2015. Kahoot: What can I say...students LOVE Kahoot! Their motto, Make Learning Awesome, sure describes what this site does! I'm not sure if it's the music, the colors, or all of the above, but any chance you get to use Kahoot...do it! It's great for exit/admit tickets, test prep, polls, and surveys. If you need help getting started with Kahoot, click here for a short tutorial. Need some ideas for different techniques for formative assessment ? Check out this graphic that briefly describes ten different types of formative assessment. 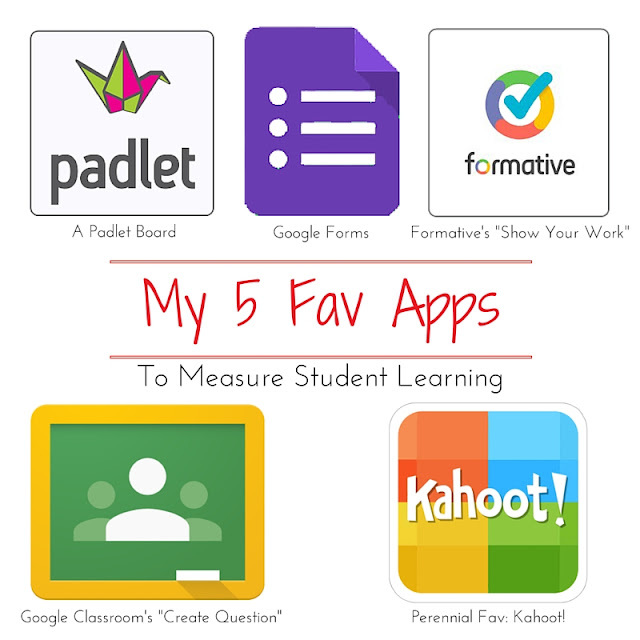 What are your favorite methods/apps for formative assessments in your classroom?